Renault introduces revised Kadjar compact SUV. 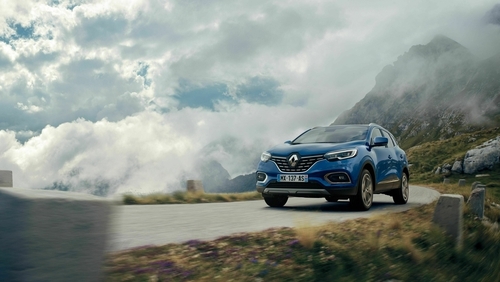 The Kadjar now has a 1.3 petrol engine for those opting out of diesel. Renault has upgraded its Kadjar SUV with a number of small styling changes and the introduction of a new small petrol engine. Coming in with a starting price of €26,995 for the petrol version, the Kadjar is hoping to sell not just on price alone, but on a fairly generous level of standard equipment from the entry level up and the addition of the new 1.3 petrol engine for those ending their relationship with diesel. It comes with 140 and 160 horse power outputs There is, however, a diesel option - the familiar 1.5 diesel that has been around for quite some time, with a 115 horse power output. It costs €28,995. Apart from changes to the front bumper, grille and revised LED lights, the changes are fairly minimal on this new model. 17" alloy wheels are now standard. There is also a 7" screen with Apple CarPlay and Android Auto, tinted windows, climate control, an electronic handbrake, parking sensors, front fog lights, cruise control, automatic lights and wipers and some synthetic leather around the steering wheel and so on. There is also a sports S-Edition with extras such as a panoramic roof and LED/Xenon lights and a petrol GT-Line with leather seats, a panoramic roof and an auto parking function.